Logitech Z623 Home Speaker SystemThis THX-Certified 2.1 system delivers powerful sound with 200 watts (RMS) of power - for big, bold audio. 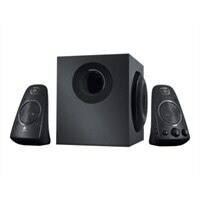 You’ll get bold sound and powerful detail from this 200-watt, THX®-Certified 2.1 speaker system. Slamming bass, clear highs, and rich mids shake some life into your music, movies, and games. Multiple convenient inputs for music, movie, and gaming devices let you make everything you listen to sound better.